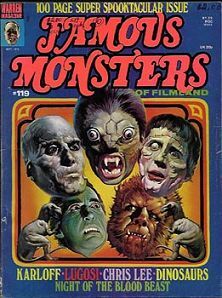 September 1975 issue of Famous Monsters with Hammer monsters montage cover. There is some writing in pen inside the "FAM" on the cover and also on the contents page. Out of the five Hammer monsters on the cover, three of them are Christopher Lee. Peter Cushing appeared in the same movies, but of course, he was always the straight man(so to speak). Website design and hosting by Sohodojo Business Services. Item 113 of 466 items displayed in viewer. 0 items in cart.